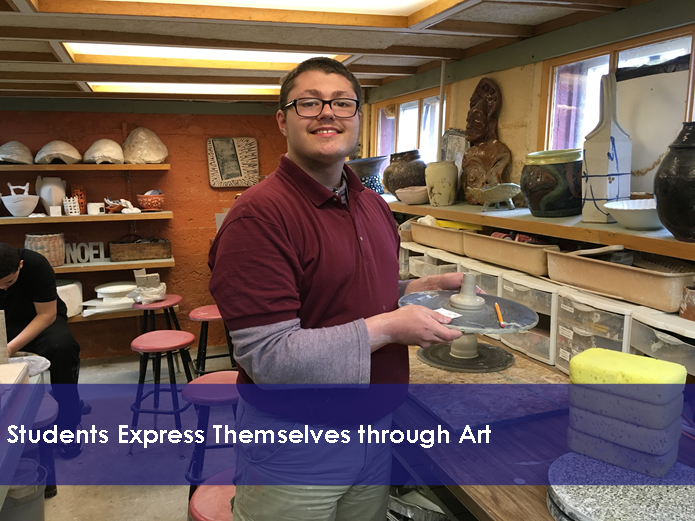 Students Express Themselves through Art | Highfields, Inc. Thanks to a grant from the W.B. and Candace Thoman Foundation, Highfields’ residential students take a yearly field trip to Schuler Arts Studio to express their creativity. For some students, spring break is an excuse to go wild. At Highfields, the residential students go wild with creativity! During the week of spring break, the students spend three days at an art workshop at Schuler Arts Studio in Albion, Michigan. Owners Nobel and Pam Schuler began their relationship with Highfields four years ago. Nobel met the President of Highfields, Brian Philson, through a mutual friend, and they began discussing the idea of creating a workshop for the students at Nobel’s studio. They agreed it would be a unique way for the students to express themselves, relieve stress, improve coping and problem-solving skills and strengthen bonds with other students and staff. Thanks to a grant from the W.B. and Candace Thoman Foundation, Brian and Nobel turned that idea into a reality. For the past four years, the students have spent part of their spring break at Schuler Arts Studio. During the workshop the students create art in different forms, whether it’s drawing on coffee filters, stamping designs into clay slabs, or getting their hands dirty on the pottery wheel. Nobel engages with the students throughout the workshop with “program concepts.” He talks to the students about different pieces of art and asks them to relate it back to their own lives. Residential student Calvin has always had a passion for art and drawing, and hopes to use it in his future career. Residential student Michael enjoyed the workshop so much that he came back a second time. He had never had any experience with art before, but once he started doing it, he found it to be a very enjoyable activity. He was able to relate the workshop to his personal situation at Highfields. The arts program has been so beneficial for the students. We are grateful that the W.B. and Candace Thoman Foundation increased funding to support expanded programming.